It’s the 100th anniversary of the Quintinshill Rail Disaster — a horrific three-train collision that resulted in hundreds of casualties, the vast majority of them soldiers en route to the war. Here’s what happened on that tragic day. The First World War was dominated by railways. The ability to rapidly transport supplies, munitions, and troops en masse is what enabled the conflict to take on its highly industrialized form. Nowhere was this truer than on the Western Front, where both sides worked feverishly to gain a transport foothold over the other. At the British homefront, this translated to an overtaxed railway system. Trains packed with soldiers, bullets, shells, and other equipment streamed from the factories to the ports. Britain’s railway authorities were challenged to deal with the dramatic increase in traffic, while also having to manage regular train activity. The stage was set for a disaster. On May 22, 1915, a mere two weeks after the Lusitania disaster, a train carrying 498 soldiers — the entire half of the 7th Leith Battalion of Royal Scots — was making its way towards Liverpool, from where they were to set sail for Gallipoli. But at 6:44 am, the train collided head-on with a local passenger train that had stopped after switching tracks to allow an express train to overtake it. Under normal circumstances, the passenger train would have waited at the Quintinshill rail loops, but there was no room owing to the influx of freight trains. When the collision happened, the troop train flipped over, with most of the cars falling onto an adjacent track. One minute later, an already tragic situation turned considerably worse: The incoming Glasgow-bound express smashed into the wreckage. 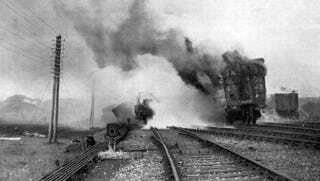 The ensuing fire engulfed the troop train, killing of hundreds of passengers. Two nearby trains also caught fire. The survivors at once got to work to help their stricken comrades and soon the whole neighbourhood was alarmed, and motor cars from near and far hastened to the spot with medical and other help. The kindness shown on all hands will never be forgotten, especially by the people from the surrounding area and Carlisle who gave such valuable assistance to the injured. Their hospitals were soon overflowing, but all who needed attention were quickly made as comfortable as possible. Their Majesties The King and Queen early sent their sympathy and gifts to the hospitals. In all, about 226 people were killed and 246 injured. A Board of Inquiry found a number of procedural failings, including the failure of the two signalmen to alert the troop-train to the presence of the parked freight train in its path. Both men were charged and found guilty of culpable homicide. Like the Titanic disaster three years prior, the incident facilitated a number of changes to prevent similar catastrophes. One hundred years later, the Quintinshill Rail Disaster is being remembered in Britain. Earlier today, Princess Anne and Scotland’s First Minister Nicola Sturgeon attended a ceremony at Gretna, on the Scottish-English border.